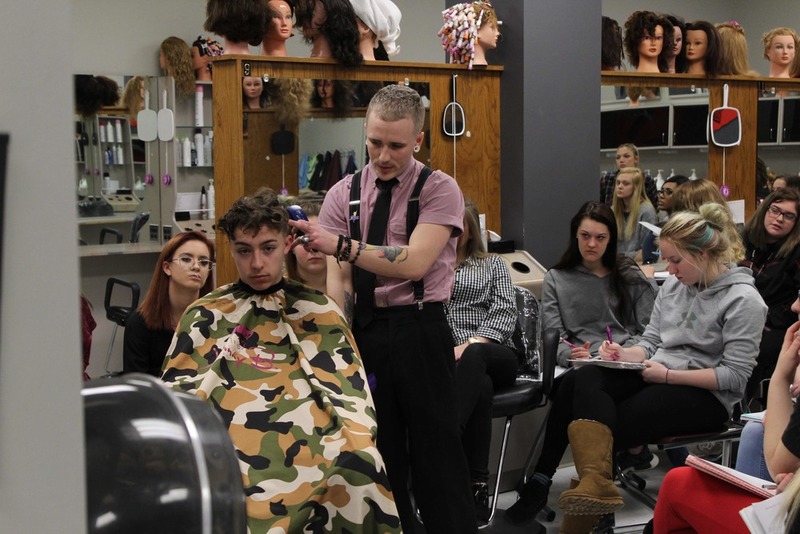 Cutting hair is an artform and Alliance High School and Career Center Cosmetology students were privileged on Friday to get some tips and tricks on their art form from a professional and haircut artist Donovan Anderson. Elizabeth Cadile, Career Center Cosmetology instructor brought Anderson in to teach students his craft of cutting men’s hair cuts. Students get plenty of lessons and experience on women’s hair cuts but could use extra practice with men’s cuts, especially the ins and outs of using clippers. Anderson is a 2013 graduate of West Branch High School and was inspired by Cadile to become a hairstylist. He attended Paul Mitchell school after graduation and currently works for Chad Anthony's Salon in Streetsboro and is a Johnny B. hairstylist and teacher. During his tutorial he gave Alliance Graduate Luke Kelley a hair cut, showing students how to get a close shave and a smooth fade to create a trendy hairstyle. He said telling students about the tips and tricks he has learned in the business makes him feel like he is helping people. “I’ve always wanted to help people and this is a way I can do that. I can pass my knowledge to them and fuel that passion they have,” he said. He explained how the techniques students are learning now can be adapted to best suit each client and hairstyle. “Giving a haircut is like tailoring a tuxedo, it’s different for each person,” he said. High School junior Juila Sitosky said just watching Anderson cut Kelley’s hair helped her to feel more confident in giving a men’s haircut. “We learn about men’s hair cutting but we have never gone that in-depth. Watching him use the clippers and his blending techniques really helped,” she said. In the spring students have the opportunity to go and take their state license test in Columbus. The high school Career/Tech class has a history of a 100 percent passage rate. Students in the cosmetology program take appointments from the public in their salon to gain experience and charge a discounted rate. To make an appointment call 330-829-2245.